The term "obstetrical palsy" was first used by Duchenne in 1872, and the description of upper root injury was described by Erb in 1874. The first surgical management of obstetric brachial plexus injury (OBPI) was reported in the early 1900's although results were poor and mortality was present. The majority of children with obstetric brachial plexus injuries have risk factors for a difficult delivery such as large size, use of forceps or vacuum, and shoulder dystocia. The successful surgical treatment of brachial plexus injuries awaited the development of microsurgical techniques in the 1970's. 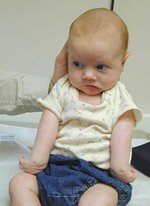 The initial treatment protocols included nerve grafting by 3 months of age. More recent studies offer the option of no nerve grafting, and instead focusing on muscle (MODIFIED QUAD) and bony (TRIANGLE TILT) surgery. In my experience, Nerve Grafting is a complicated and usually unnecessary procedure which in my research may cause worse outcomes long- term than just Muscle and Bone surgeries. Muscle and bone surgeries take less time, have less morbidity and offer significantly better outcomes than Nerve grafting alone in my experience. The concept that surgery will improve function in OBPI has been supported in many studies worldwide. There is little to no literature that shows therapy alone to have any effect on structural problems such as contractures and bony/ joint deformities that the Modified Quad and Triangle Tilt surgeries are designed to address. At The Nath Brachial Plexus Institute, we believe strongly that surgical intervention in appropriate cases will maximize movement, sensation and growth in the affected arm and hand. We believe that the key to our success is in careful selection of appropriate patients and timely surgical intervention with the latest techniques in reconstructive surgery.